حسن‌پور, مصطفی, دبیری, نورالدین. (1396). مدل‌سازی و حل ابتکاری مسئله برنامه‌ریزی موجودی با ملاحظه تنوع در روش‌های حمل‌ونقل. پژوهشنامه حمل و نقل, 14(2), 275-290. 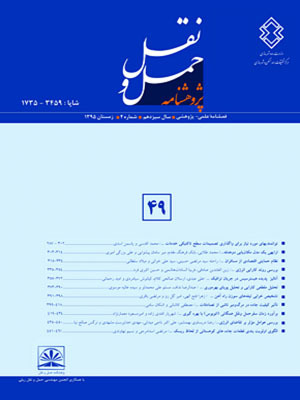 مصطفی حسن‌پور; نورالدین دبیری. "مدل‌سازی و حل ابتکاری مسئله برنامه‌ریزی موجودی با ملاحظه تنوع در روش‌های حمل‌ونقل". پژوهشنامه حمل و نقل, 14, 2, 1396, 275-290. حسن‌پور, مصطفی, دبیری, نورالدین. (1396). 'مدل‌سازی و حل ابتکاری مسئله برنامه‌ریزی موجودی با ملاحظه تنوع در روش‌های حمل‌ونقل', پژوهشنامه حمل و نقل, 14(2), pp. 275-290. حسن‌پور, مصطفی, دبیری, نورالدین. مدل‌سازی و حل ابتکاری مسئله برنامه‌ریزی موجودی با ملاحظه تنوع در روش‌های حمل‌ونقل. پژوهشنامه حمل و نقل, 1396; 14(2): 275-290. The vendor managed inventory is one of the common policies in supply chain partnership that allows a vendor to place orders on behalf of the customers according to the constraint that are agreed upon a contractual agreement. In this paper, we propose a two-echelon supply chain model consisting of a single vendor and multiple retailers under the VMI strategy which specifies the space limits of the retailers' warehouses and penalty costs for excess of stocks by considering different transportation modes under different capacities. Then, the resulted non-linear programming model by proposing a heuristic method[s1] . In this model, retailers’ order cycles are considered independent of each other and also independent of the vendor’s distribution[s2] cycle. Furthermore, the costs associated with the variety of the items and their shipping is considered based on the orders quantities and transportation mode. The aim of the proposed model is to determine the quantity of the orders along with the number of shipments received by retailers and transportation mode such that the total inventory and transportation costs of the chain are minimized jointly, especially for large dimension problems in a short time. The exact optimal solution of this model is obtained by coding in common mathematical optimization software, Lingo, and the result is compared with the result derived from our proposed heuristic method. [s3] It is found that the running time of the exact solution is highly affected by the increase in the number of the retailers, and the suggested heuristic method is capable of solving the model in a much less time. - Cárdenas-Barrón, L. E., Treviño-Garza, G., & Wee, H. M. (2012), A simple and better algorithm to solve the vendor managed inventory control system of multi-product multi-constraint economic order quantity model. Expert Systems with Applications, 39(3), pp.3888-3895. - Darwish, M., & Odah, O ((2010)­, Vendor managed inventory model for single-vendor multi-retailer supply chains. European Journal of Operational Research, 204(3), pp.473-484. - Disney, S. M., Potter, A. T., & Gardner, B. M. (2003), The impact of vendor managed inventory on transport operations. Transportation Research Part E: Logistics and Transportation Review, 39(5), pp.363-380. - Duan, Y., Luo, J., & Huo, J. (2010), Buyer–vendor inventory coordination with quantity discount incentive for fixed lifetime product. International Journal of Production Economics, 128(1), pp.351-357. - Goyal, S. K., & Nebebe, F. (2000), Determination of economic production–shipment policy for a single-vendor–single-buyer system. European Journal of Operational Research, 121(1), pp.175-178. - Hariga, M., Gumus, M., Daghfous, A., & Goyal, S. (2013), A vendor managed inventory model under contractual storage agreement. Computers & Operations Research, 40(8), pp.2138-2144. - Pasandideh, S. H. R., Niaki, S. T. A., & Nia, A. R. (2011), A genetic algorithm for vendor managed inventory control system of multi-product multi-constraint economic order quantity model. Expert Systems with Applications, 38(3), pp.2708-2716. - Qin, Y., Tang, H., & Guo, C. (2007), Channel coordination and volume discounts with price-sensitive demand. International Journal of Production Economics, 105(1), pp.43-53. - Ramanathan, U. (2013), Aligning supply chain collaboration using Analytic Hierarchy Process. Omega, 41(2), pp.431-440. - Sari, K. (2008), On the benefits of CPFR and VMI: A comparative simulation study. International Journal of Production Economics, 113(2), pp.575-586. - Simchi-Levi, D., Kaminsky, P., & Simchi-Levi, E. (2004), Managing the supply chain: the definitive guide for the business professional: McGraw-Hill Companies. - Yao, Y., Evers, P. T., & Dresner, M. E. (2007), Supply chain integration in vendor-managed inventory. Decision support systems, 43(2), pp.663-674. - Zhang, T., Liang, L., Yu, Y., & Yu, Y. (2007), An integrated vendor-managed inventory model for a two-echelon system with order cost reduction. International Journal of Production Economics, 109(1), pp.241-253.